In the previous Article “ Visual Software for Outdoor Lighting Design – Part One ”, I explained the Visual program interface. 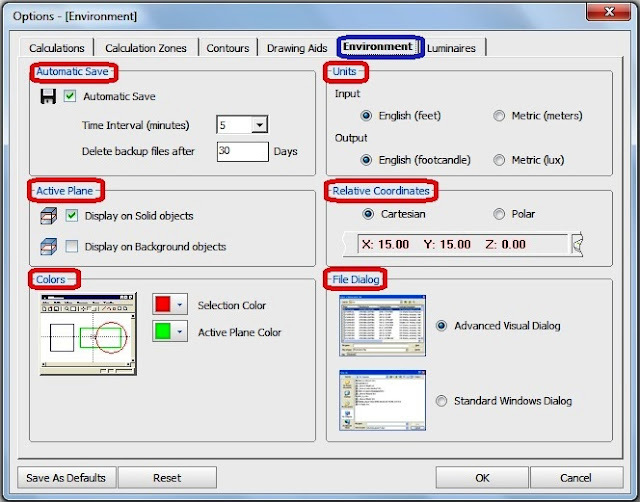 Today, I will explain steps of Outdoor lighting design calculations by using Visual Professional Edition Software as follows. Before you start 'the First Project’ you should check the default settings of Visual Professional Edition Software. By means of default settings in the option form you can specify parameters that affect all future projects. The Options Form is accessed through the TOOLS MENU of the main menu. 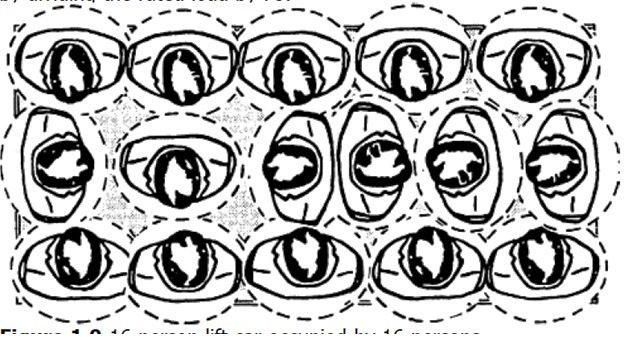 This is where parameters affecting the global operation of Visual reside. The Options Form Tabs provides a means for customizing the interface to meet specific needs and/or user preferences. 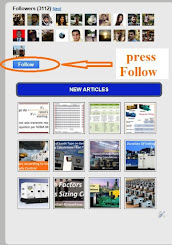 Each tab includes options which are logically grouped and labeled for easy identification. This Tab contains sections that control what types of calculations Visual performs and displays in conjunction with the CALCULATE command. Each of the sections in this category is described below. In the Direct Only mode, only light coming directly from the model’s Luminaires will be accounted for. In the Direct and Interreflected Calculation mode, Solid Objects will reflect incident light according to their defined diffuse reflectance value and contribute with the model’s luminaires in the calculations. It controls which statistics are reported and displayed in the statistical summaries available in the Design Environment and the Print Editor. All of the available statistical options are computed whenever the CALCULATE command is issued. It contains sections related to the format, display and default specifications of Calculation Zones and Calculation Zone values. Each of the sections in this Tab is described below. When a Calculation Zone is created the user is prompted for the offset, row spacing and column spacing of the zone. 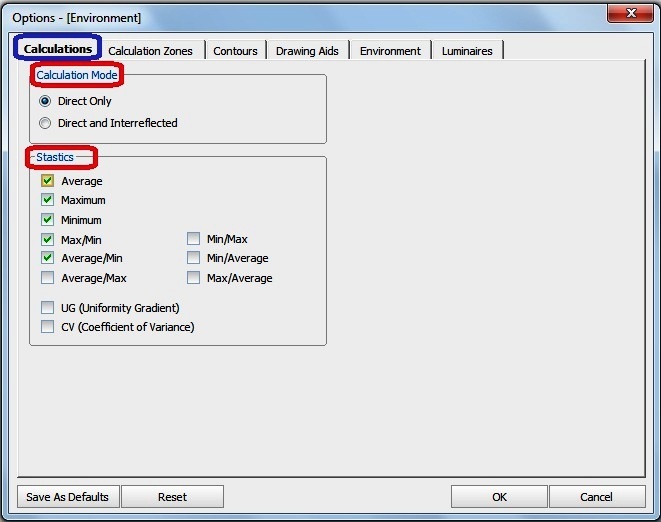 The text boxes corresponding to these parameters are initially filled with default values. These defaults can be set in the Calculation Zones Default option group. The Offset, Row Spacing and Column Spacing text boxes are edited by either numeric entry from the keyboard or choosing from the commonly used values given in the list box. It controls the default setting for the number of decimal places displayed for illuminance values. It controls the default color and point style settings for all subsequent Calculation Zones. It determines how the grid of points is placed within the defined Calculation Zone. If the Offset Calculation Points option is not checked, then the first calculation point is placed coincident to the first point used to define the Calculation Zone The placement of subsequent calculation points is based on this initial point and the specified Row and Column Spacing settings. If the Offset Calculation Points option is checked, then the first calculation point is displaced from the first point used to define the Calculation Zone by a distance of one half the Row and Column Spacing setting in the corresponding dimension. 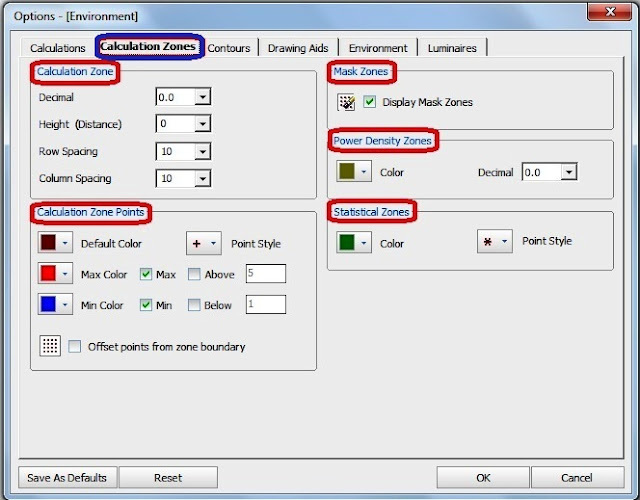 The Show Masked Area Boundaries button toggles the display of Calculation Zone masking regions (dashed purple polygons) on and off. It controls the default setting for color and the number of decimal places displayed for illuminance values. It controls the default color and point style for all subsequent Statistical Zones. 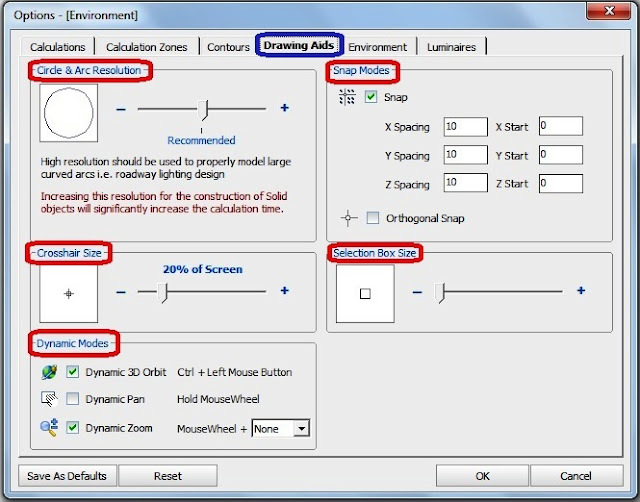 The Contours Tab contains sections related to the calculation and display of Calculation Zone illuminance contours. Each of the sections in this Tab is described below. Contours Lines Definition: Each of these lines indicates all the positions on a Calculation Zone that have the same illuminance value. If the Contours Status Toggle is set to on, then iso-illuminance contour lines will be displayed for any Calculation Zone with currently calculated point illuminance values. It controls how many contour lines are displayed and what color they are drawn in. The Contour Values Tab has ten input blocks. If a block is on, then the text box will have a white background and a colored bar appears in the list box. If a block is not on, then both the text box and the list box bar are grayed. Each block can be toggled on and off by Left Clicking on the list box bar. 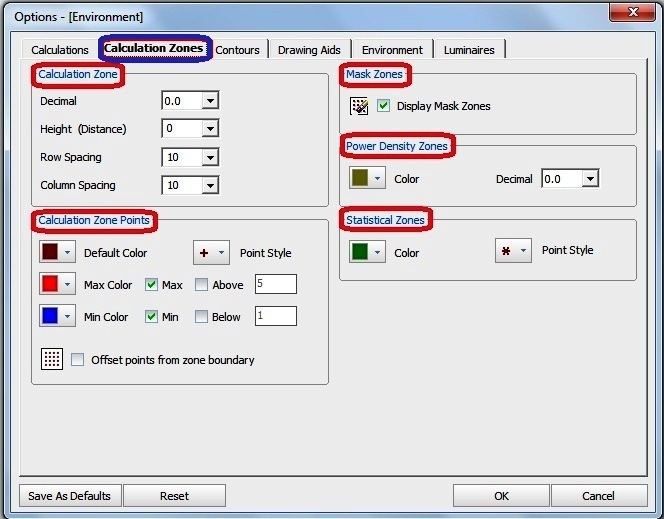 For each option block that is on a contour line is drawn wherever a Calculation Zone has the same numerical value of illuminance as the number displayed in that block’s text box. The contour line will be drawn in the same color as the colored bar shown in the list box. The illuminance value associated with a given contour line is set by editing the value in the text box. The Contour Labels button toggles the display of Contour Labels on and off. 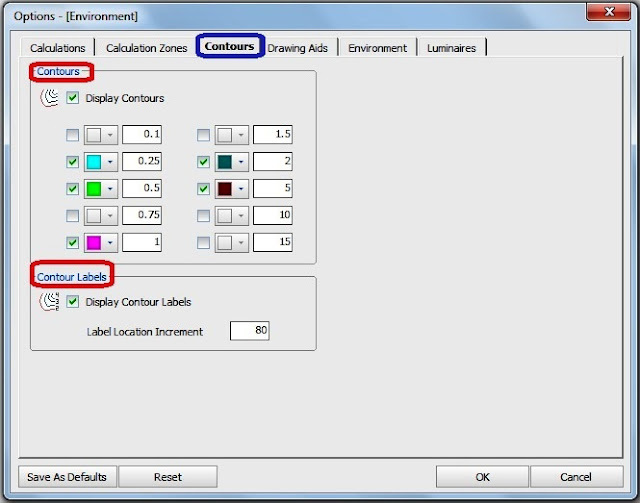 The value in the Label Increment field sets the number of linear units (feet or meters) between contour labels along a particular contour line. The Drawing Aids option category contains options that help the user to efficiently create and manipulate designs in the Design Window. Each of the options in this Tab is described below. All circles and arcs that are constructed in the Design Environment are treated as polygons or sections of polygons. The Circle/Arc Resolution option allows the user to specify how closely these polygons represent true circles or arcs. The lower this value, the smaller the polygon segments will be and the more closely the polygons will resemble true circles and arcs. The Crosshairs option group controls the appearance of the Selection Box and mouse crosshairs that represent the location of the mouse pointer in the Design Window. Dynamic 3D Orbit: provides a fully interactive 3-D interface for the construction and analysis of lighting models. Dynamic Pan: It refers to a linear translation of the graphic presented in the Design Window by selecting a reference point in the graphic space of the Design Window followed by the new location for that point. Dynamic Zoom: The field of view is enlarged and reduced. The Incremental Snap group controls the functioning of the Incremental Snap feature. Incremental Snap, is toggled on and off by Left Clicking on The toggle button at the top left corner of the Incremental Snap option group. The current status of the Incremental Snap feature is shown to the right of the button. The six text boxes in the group specify the spacing and positioning of the Snap Grid. The left column of text boxes sets the spacing between adjacent snap points. A box for each of the cardinal axes allows the spacing between snap points to be set independently for the X, Y and Z dimensions. The right column of text boxes specifies the 3-D coordinates of a single snap point from which the rest of the snap points are spaced. 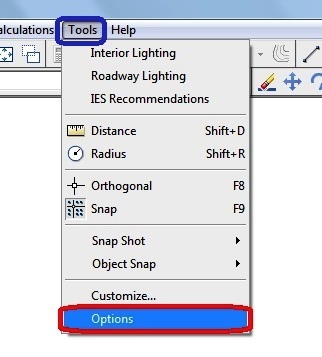 This option controls the position of the snap grid with respect to the coordinates of the Design Window. The Orthogonal Mode is toggled on and off by Left Clicking on the toggle button in this group. The current status of the Orthogonal is shown to the right of the toggle button. It graphically shows the current size of the Selection Box. The slide bar beneath the picture is used to change the size of the Selection Box. The chosen size of the Selection Box affects the functionality of the pointer in the Design Window. When the Selection Box is used to select objects in the Design Window with a single Left Click (as opposed to windowing or fencing), all objects that have lines crossing through the Selection Box are selected. For more detailed drawings, a smaller Selection Box is often needed to select objects accurately. It contains backup settings controls. The AUTOMATIC -SAVE Toggle Button turns the Auto-Save feature on and off. If AUTOMATIC-SAVE is on, the entry (in units of minutes) in the Time Interval Text Box controls how frequently the design is Auto-Saved. The "Delete backup files after" Text Box sets the amount of time, in days, that Visual will delete the backup files after end of it. The Design Environment’s working plane is graphically indicated by Phantom Lines. If display on solid objects check box is checked, then Phantom Lines will be drawn on Solid Objects only. If display on Backgrounds objects check box is checked, then Phantom Lines will be drawn on Background Objects as well as Solid Objects. In the Design Window, selected objects are highlighted with a color. Likewise, if the working plane is coplanar with an object (and the Phantom Lines option is on), that object will be highlighted with a color. To choose a new color for either item, Left Click the down arrow at the right of the box and then select a color from the drop-down pallet. Design Environment. The Output Units setting corresponds to the illuminance values calculated by Visual. Coordinates setting determines whether these coordinates are displayed in Cartesian or polar (distance and angle) format. User can select between the advanced visual dialog with options written in tabs and standard windows dialog with options set adjacent to each other in windows. The Luminaire Tab contains default specifications used in conjunction with the PLACE LUMINAIRE command and the Luminaire Schedule Form. Each of the sections in this Tab is described below. Set the default values for the Mounting Height and Orientation if the display photometric web box is checked. The Mounting Height entry specifies the default Mounting Height for Luminaires. The Orientation entry specifies the default setting for the horizontal orientation of the Luminaire as measured in degrees. The Luminaire Aiming settings determine how Visual interacts with aimed luminaires. Turning Lock Aim Points when moving luminaires to ON so when moving a luminaire also moves its aim point. Checking the Label Luminaire At Aim Points checkbox causes Visual to place luminaire labels next to the aim point rather than next to the luminaire, when Luminaire Labels are turned on in the Print Editor. The light loss factor (LLF) and a prorated lamp lumens value are edited via the editable list boxes provided for each Luminaire Type . The predefined values contained in these list boxes can be edited using the Schedule Defaults option group. Checking the Use Luminaire Symbol Color checkbox forces template lines to use the same color as their associated Luminaire. This overrides any user-defined template colors. Each input block in this group controls the default illuminance value and display color for the six available template lines. Default illuminance values are edited using the text box at the top of each block. The default display color is edited using the drop-down pallet at the bottom of each block. It is useful to understand how Templates are created. 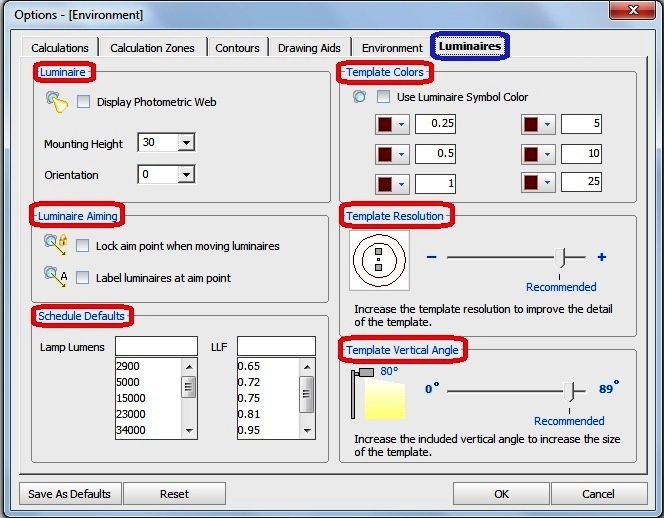 Whenever a new Template needs to be created for a particular Luminaire, Visual creates a temporary Calculation Zone and uses it to generate the iso-illuminance contours that comprise the Template. This Calculation Zone is centered on the Luminare and is offset by the Mounting Height. The Calculation Zone extents are determined by multiplying the tangent of the included angle (as specified by the Vertical Angles slider) with the Mounting Height of the Luminaire. Thus, if the Vertical Angles slider specified 45°, and the Luminaire Mounting Height was 30 feet, the Calculation Zone would extend 30 feet in each direction. The point spacing used for the Calculation Zone is some percentage of the Luminaire Mounting Height. This percentage is set using the Template Resolution slider. At its lowest setting (all the way to the left), the percentage is set to 100%, so each calculation point in the above example would be 30 feet apart. At its highest setting (all the way to the right), the percentage is set to 1%, so each calculation point would be 0.3 feet apart. These parameters should be changed with caution, as extreme settings can adversely affect graphical performance or template accuracy. In the next article, I will explain how to start a new design for outdoor lighting by using Visual professional edition software?. Please, keep following.